The DualZip cable tie from Micro Plastics combines the functionality of both a releasable and a permanent tie in one part. The permanent lock is so strong that, under normal circumstances, the part will fail with the strap breaking before there is slippage within the lock. The releasable lock can be ratcheted and released many times and will continue to reliably lock. With this design, the teeth are on the outside of the bundle diameter, making it easy to release, and the release tab is located up and away from the bundle for easy access every time. 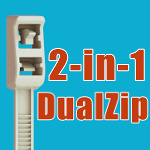 The DualZip Cable Tie is available in 8-in. length. Free samples available on request. Can foam stop a bullet? Cool Tools: Injection Molding Material Selector! Modern society has become familiar enough with technology that robots must go beyond just a superficial likeness to impress. What separates an authentic humanoid robot from a banal doll (besides being a way more exciting Christmas present) is that its anthropomorphism is expressed through its material composition, geometric proportions, mechanical operations, autonomy and actions. And since FUTEK had reputably pioneered sensor designs for applications like the Mars Rover, FUTEK brought their own cutting-edge technologies to the humanoid table. Learn More on This Application. A first-of-its-kind cooler for NASA's James Webb Space Telescope, scheduled to launch in 2018, has completed testing at NASA's Jet Propulsion Laboratory in Pasadena, CA. About the size of a household fridge (and working in a similar manner), it is key to helping catch faint whispers of light from the very first stars born in our universe. But why do you need a cooler in the dead-cold conditions of outer space? In a recent video making the rounds on the internet, a piece of armor is seen obliterating a speeding bullet. Some experts in the U.S. Army Research Laboratory's Weapons and Materials Research Directorate give their take on it. One of the main reasons for limiting the operating lifetimes of nuclear reactors is that metals exposed to the strong radiation environment near the reactor core become porous and brittle, which can lead to cracking and failure. Now, a team of researchers at MIT and elsewhere has found that, at least in some reactors, adding a tiny quantity of carbon nanotubes to the metal can dramatically slow this breakdown process. Goodfellow offers a custom alloy service to design engineers seeking performance characteristics not available from standard alloys. Custom alloys, usually vacuum-cast but sometimes produced through mechanical alloying, have been made with gold, silver, palladium, platinum, copper and/or nickel as major constituents, with other elements added to create unusual alloys and alloys that contain challenging combinations. The alloys are generally available as foil, wire and sheet, although other forms can be considered. Engineers developing the new 10-speed automatic transmission available in the 2017 Chevrolet Camaro ZL1 built on the experience of previous, critically acclaimed Hydra-Matic multispeed transmissions to push its performance, refinement, and efficiency advantages to a new threshold. Proto Labs’ pocket-sized Material Selector is a quick reference guide to help you identify the right thermoplastic and liquid silicone rubber materials for your next injection molding project. It lists specific measurements like tensile strength, heat deflection and durometer to ensure you have the most suitable material for your part’s application. 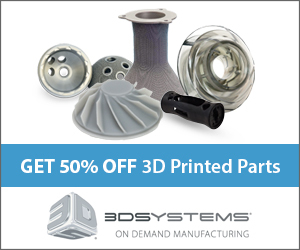 Get a free Material Selector today! The rapid development of modern 3D CAD systems has facilitated a move to more organic forms and ever-increasing geometry complexity. Just think about the change in design from the conventional box-shaped vacuum cleaner to the modern Dyson. This article focuses on design fundamentals like wall thickness, rib designs, and draft angles and the impact they have when it comes to complexity vs. manufacturability. Lee Spring's 2016 Midyear Catalog is available now. It is an industry standard listing 23,000+ Compression, Extension, Torsion, and Specialty Springs. This year's catalog includes an expanded HEFTY™ Die Series lineup and an expanded selection of Stainless Steel 316 springs. Also included are LeeP™ Plastic Composite Springs, REDUX™ Wave Springs, BANTAM™ Mini Compression Springs, Lite Pressure™ Series Compression Springs, Battery Springs, and Constant Force. ISO 9001 Registered. Request a catalog today. It's a must-have resource. When designing a pair of injection-molded thermoplastic parts that need to be mated together, product designers and engineers will often create two distinct halves that can connect to one another. But sometimes, if the two halves are similar or identical, it's worth exploring the cost-effective -- though sometimes challenging -- design technique of creating a single part that, when rotated 180 degrees, can mate to its symmetrical self. 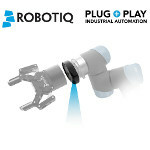 Robotiq has just launched a new vision-guided pick-and-place solution for those oh-so-popular Universal Robots. This camera can be working on a shop floor in 5 minutes flat. No external PC is required to set up, program, or run the camera -- the camera’s user-friendly software is seamlessly embedded within Universal Robot’s graphical user interface. The compact camera design fits perfectly on the UR wrist and offers direct connectivity to the controller. Early users of the system say Robotiq’s Camera breaks down all the integration barriers we are used to seeing with vision systems in manufacturing automation. Tolomatic’s family of MXB electric belt-drive actuators includes a new solid-bearing load-carrying design ideal for harsh environments. The trapezoidal solid bearing provides a rigid, long-lasting bearing system capable of operating in environments that roller bearings would not be able to withstand. 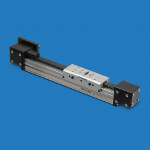 With loads up to 520 lb, speeds to 100 in./sec, and strokes up to 230 in., the MXB-S belt-drive actuator is an economical solution for light- to moderate-loading applications requiring high duty cycle and high speeds over long strokes. The Compact Ring Drive (CRD) system from Nexen Group features a precision-grade bearing and drive mechanism in a sealed housing. Freely programmable, three drive configurations allow the CRD to be optimized for high speed, high torque, or both, depending on the application. The combination of Nexen’s roller pinion technology with integrated bearing and motor/gearhead delivers a rigid, smooth system with zero backlash options from the motor through the driven load. The CRD is ideal for applications including cutting systems, gantry systems, medical products, robotics, aerospace, machine tool, semiconductor, and material handling. Today's Soldiers often rely on GPS to know their location and to help with successful mission planning. Pseudolites, satellite-like transmitters, could take over as the primary location information capability when Soldiers' GPS systems are blocked by environmental or adversarial sources. Toyota Connected, a new company that aims to redefine data management and data services development in the automotive world, will collect driving -- and driver -- data using Microsoft’s Azure cloud technology. CEO Zack Hicks explains how he wants to give customers an escape from the “tyranny of technology.” But does your car really need to know everything about you? Dow Automotive Systems is on a roll introducing customized structural bonding solutions for weight reduction in high-end vehicles. Among those manufacturers using specially formulated adhesive solutions based on BETAFORCE composite bonding adhesives are Audi for the new R8, Lamborghini on its Huracan, and BMW in its 7 series. BETAFORCE composite bonding adhesives can be used to bond coated metals like steel to aluminum, carbon fiber panels to steel or aluminum, sheet molding compound (SMC) to aluminum, and more. As a design engineer at Fiat Chrysler Automobiles working at Canada's Automotive Research and Development Centre in Windsor, Ontario, Chad Vermeulen is a firm believer in the power of asking, "What if?" Vermeulen, who counts working on the design of the Stow ‘n Go seating system for the 2017 Chrysler Pacifica as one of his key projects, is a big fan of using a LEGO set to get his creative ideas flowing. This Texas Instruments video demonstrates the DRV8305-Q1’s ability to drive a motor during a cold-crank situation. The device eliminates the need for extra circuitry and is able to operate down to 4.4 V while driving the motor and PWM on the gate of the power FETs.